Campaigners have renewed calls for Scottish financial institutions and the Scottish Parliament to stop funding nuclear weapons, after a new report highlighting continuing global investment in nuclear weapons producing companies was released on 7 March 2018. The 2018 Don’t Bank on the Bomb Report lists 26 British financial institutions that have made an estimated £24.5 billion available to nuclear weapons companies since January 2014. Two Scottish financial institutions feature in the report’s “Hall of Shame” because they continue to “invest significantly” in the world’s top 20 nuclear weapons producers. According to the report Royal Bank of Scotland has invested an estimated £2.6 billion  in 15 of the top 20 companies since 2014. 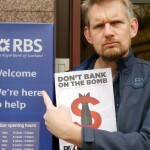 RBS policy states that while the financing of nuclear weapons related activities is restricted, it is not automatically prohibited and the companies involved are not excluded from RBS investment. The other Scottish Hall of Shame entrant, Standard Life Aberdeen, invested an estimated £219 million in three companies involved in Britain’s nuclear weapons programme during the same period: BAE Systems, Jacobs Engineering and Serco. The report’s “Hall of Fame” highlights financial institutions which have adopted comprehensive policies prohibiting any type of investment in nuclear weapons producers. Many of these policies make reference to the Treaty on the Prohibition of Nuclear Weapons, which was adopted by 122 countries at the United Nations in July 2017. The treaty prohibits states parties from possessing, developing, producing, testing or using nuclear weapons. The Don’t Bank on the Bomb report is produced by Pax, a member of the International Campaign to Abolish Nuclear Weapons (ICAN), which promoted the Ban Treaty and was awarded the Nobel Prize in December. “Nuclear weapons are immoral and inhumane and the gravest threat to the survival of humanity”, Dr Michael Orgel, and a member of Medact Scotland, which is a member of the Don’t Bank on the Bomb Scotland Network and an affiliate of International Physicians for the Prevention of Nuclear War said, “and now a majority of the world’s countries have agreed that they should be illegal under international humanitarian law. Scottish financial institutions risk their reputations and their business by continuing to invest in companies that undertake nuclear weapons work. Instead, they should follow the example of the many organisations that adhere to the nuclear ban treaty and expressly prohibit investment in the producer companies”. 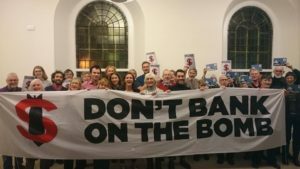 “We are urging the pension fund’s board of trustees to stop allowing investments in companies like Rolls Royce, which makes the nuclear reactors for Britain’s nuclear-armed submarines”, said Brian Larkin, Coordinator of the Edinburgh Peace & Justice Centre , a member of the Don’t Bank on the Bomb Scotland Network. “Most Members of the Scottish Parliament oppose Trident but until these investments are stopped, MSPs are effectively benefiting from the UK’s nuclear weapons programme”. The Don’t Bank on the Bomb Report comes after a poll showed that 72% of Scots oppose the Scottish Parliamentary Pension Scheme’s investments in armaments, fossil fuels and tobacco. 1. The Don’t Bank on the Bomb Scotland Network includes, Scottish CND, Medact Scotland and the Edinburgh Peace & Justice Centre. 2. $ to £ conversions done with 7 March 2018 exchange rate on xe.com.